Running a food blog is an effective way to find your food preference. You slowly start to realize what types of food you truly like, as well as what ingredients you’re comfortable using and eating. I’ve learned that I generally prefer more natural foods; notice I didn’t say healthy. While that is important, I feel it’s also important to be able to treat yourself, and enjoy things like this Homemade Cookies and Cream Raspberry Parfait every now and then. Yum! Chocolate cookies can be a common ingredient for crusts and desserts; which this recipe features. Oreo’s are an easy option if you scrape out the oil and sugar based filling. If you know of a healthier and more natural option for chocolate cookies please let me know in the comments below. 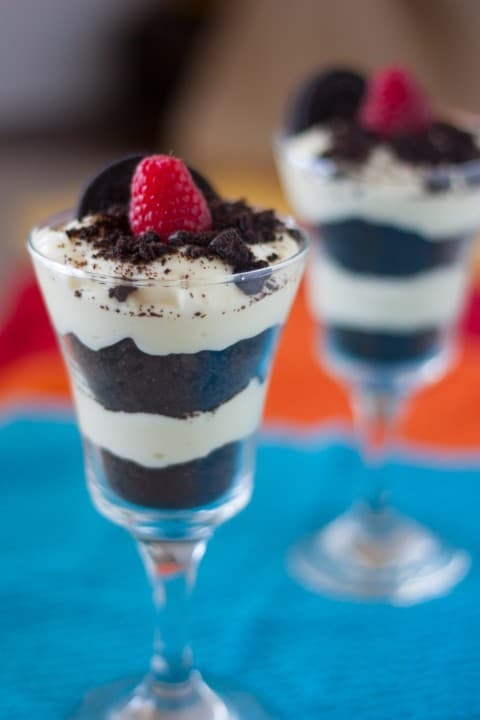 I’m comfortable with this compromise in order to make this decadent Homemade Cookies and Cream Raspberry Parfait dessert. Remember all things in moderation. I adapted and modified this recipe from one that featured instant pudding mix and canned whipped topping; instead I included instructions on how to make real vanilla pudding, as well as whip cream, from scratch. It’s more work and worth it, but if you don’t mind the packaged ingredients feel free to substitute. The homemade pudding creates a richer, creamier base for these Cookies & Cream Raspberry Parfaits. 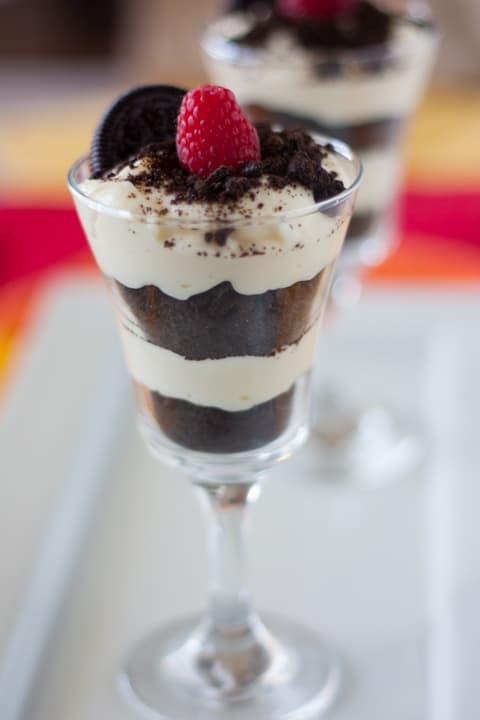 Homemade vanilla pudding mixed with cream cheese, fresh whipped cream and sweetened condensed milk, layered with chocolate cookie crumbles and fresh raspberries, all adds up to a sinfully delicious dessert. When cooking the pudding base, carefully watch it till it boils. I learned the hard way that it will quickly expand and boil over, creating a mess all over your stove. Hey, I’m not ashamed to admit that even food bloggers aren’t perfect in the kitchen. I shot this in natural light at 1/100 sec, f/ 1.8, ISO 400. The photography for this recipe was all about depth of field. A large aperture, like 1.8, creates a shallow depth of field. I wanted the front cup stand out in front, while a blurred one in the background helps round out the scene. Layered colored dish towels in the background add color and creates a layered effect throughout the image. 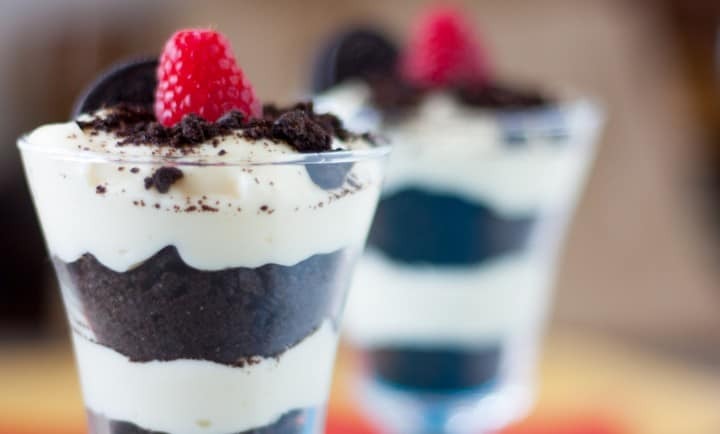 Pudding mixed with cream cheese, fresh whipped cream and sweetened condensed milk, then layered with chocolate cookie crumbles and fresh raspberries, all adds up to a sinfully delicious dessert. Pudding: Stir 2 cups milk and salt in a medium saucepan. Sprinkle sugar on top and do not stir; turn heat to medium-high. Meanwhile in a small bowl quickly combine cornstarch with remaining ½ cup milk, add egg yolks and mix well. When milk in pan comes to a full boil, remove pan from heat and stir in cornstarch mixture. Pudding will start to thicken. Return to heat and cook for 1 minute. Remove from heat; stir in vanilla and butter. Cool slightly. In large bowl, beat cream cheese, butter and powdered sugar until smooth. In separate large bowl, beat heavy whipping cream with electric mixer on medium speed until stiff peaks form, 5-7 minutes. Stir cream cheese mixture into pudding, then fold in whipped cream. 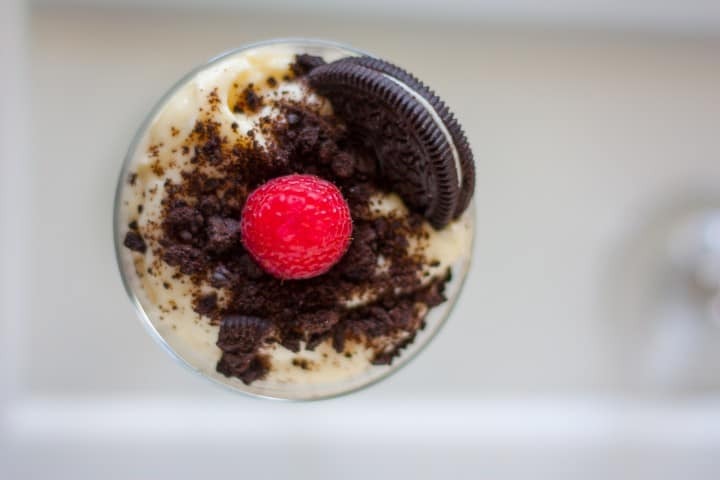 Create ½ inch layer of crushed Oreo cookies in dessert glasses (or larger dish of choice). Layer with pudding mixture. Repeat layering as necessary. Refrigerate for at least 2 hours to cool and set pudding. Top with raspberries before serving. Notes: Recipe adapted from http://www.tasteofhome.com/recipes/creamy-vanilla-pudding and Taste of Home: No-Bake Recipes. Print. Summer 2014. I am so glad to have stumbled by your blog – your pictures are gorgeous – thanks for the mini photography lesson and delectable recipe! My daughter suffers from a slight glutton sensitivity and I use glutino chocolate sandwich cookies – not sure (other than the fact they are not made with flour) how much healthier they might be to oreos – I need to check them out more now!! Hi Shashi! I’m glad you found it too. I do photography tips on each recipe, and starting to do more in-depth food science and cooking tips as well. Thanks for the suggestion. Some of my recipes are gluten-free and I’m working on categorizing them as well. Your photography is as delicious as this recipe! Indian chef. It’s a fabulous movie as is the music by A. R. Rahman. Thanks for the positive comments and the recommendation Cheryl! I really liked the movie Chef too!